Welcome to our August Block of the Month! I’m Designer/Radio show host Pat Sloan! 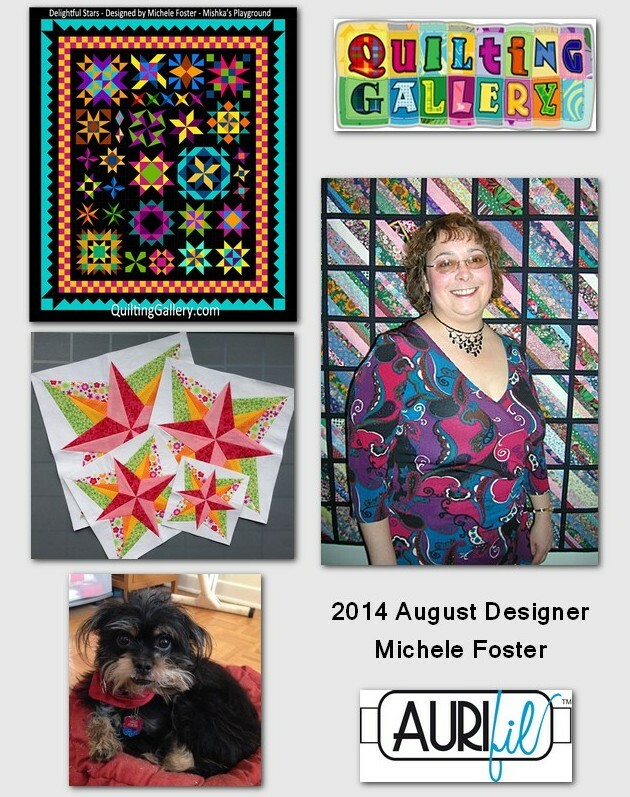 Michele Foster is the designer, producer and developer of the amazing Quilting Gallery website. If you have not discovered her site yet.. CLICK HERE right now, sign up for her newsletter and then come back.. I’ll wait… Back? GOOD! Michele and I have been friends for a very long time. She lives in Ottawa, Ontario – Canada’s National Capital. 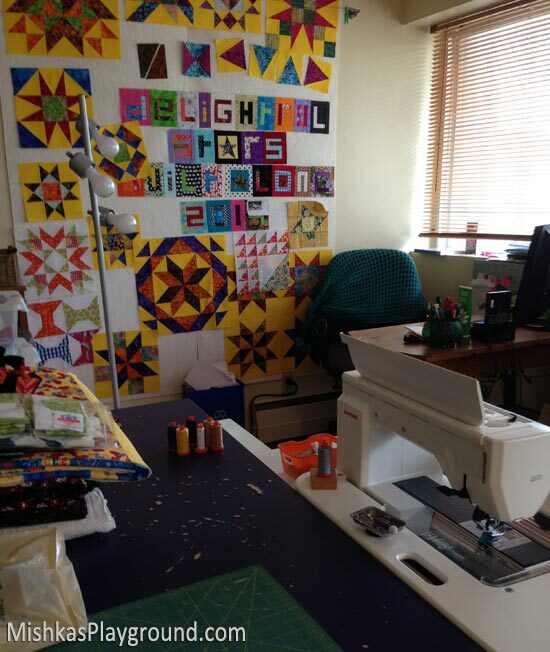 Michele’s online website, her quilt designs (HERE) and her quilt communities are wonderful, fun and friendly! 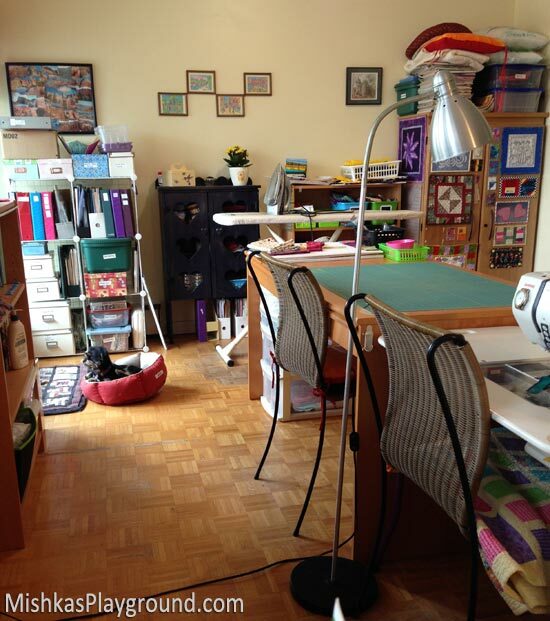 She hosts all kinds of projects, including super successful swaps and sew alongs. I’m in love with her quilt patterns too! I am doing her Delightful Stars .. we’ll i’m doing TWO of them.. in some special fabrics! 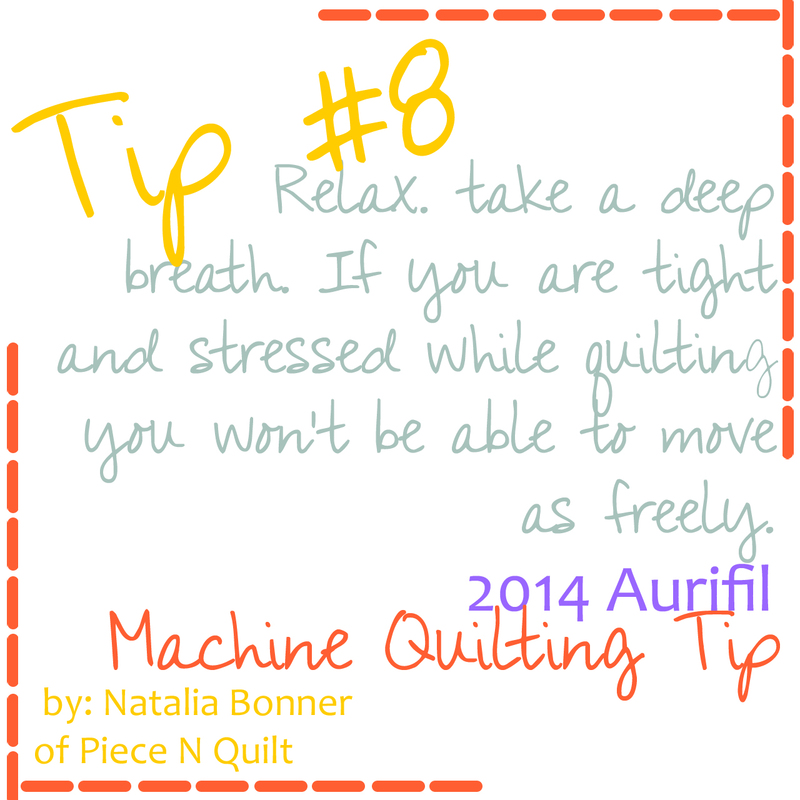 Michele has also been using Aurifil thread forever! Let’s get to know Michele! Before moving to Ottawa, I lived in a small-ish town north of Toronto. In the strip mall that I visited regularly was a quilt shop. For several months, every time I went there I stopped and looked at the beautiful displays of quilts in the window. I’d marvel at the gorgeous colours, tiny calico prints and intricate designs. 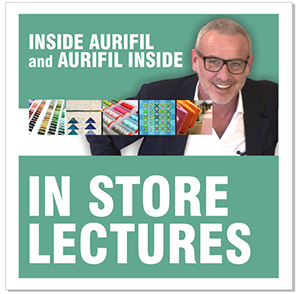 I’d peek into the windows and watch the shop attendants work and the class participants learn. I can only imagine what they thought of this young lady peeking into their windows every week. At the same time, I was enrolled in evening college classes taking clothing design and pattern making. My parents found and bought me a wonderful used Singer machine in the cabinet. I needed a serger to complete my school courses and picked up a used one from a family friend. So, I had some sewing experience, but had no idea about making a quilt. Finally, I gathered up the courage to go into that local store. I’m glad that I did. I was definitely the youngest in the store and in the beginners’ class that I signed up for. Even though I was not really made to feel welcome, I completed the class and the quilt. Oh, I’m getting ahead of myself … next question. 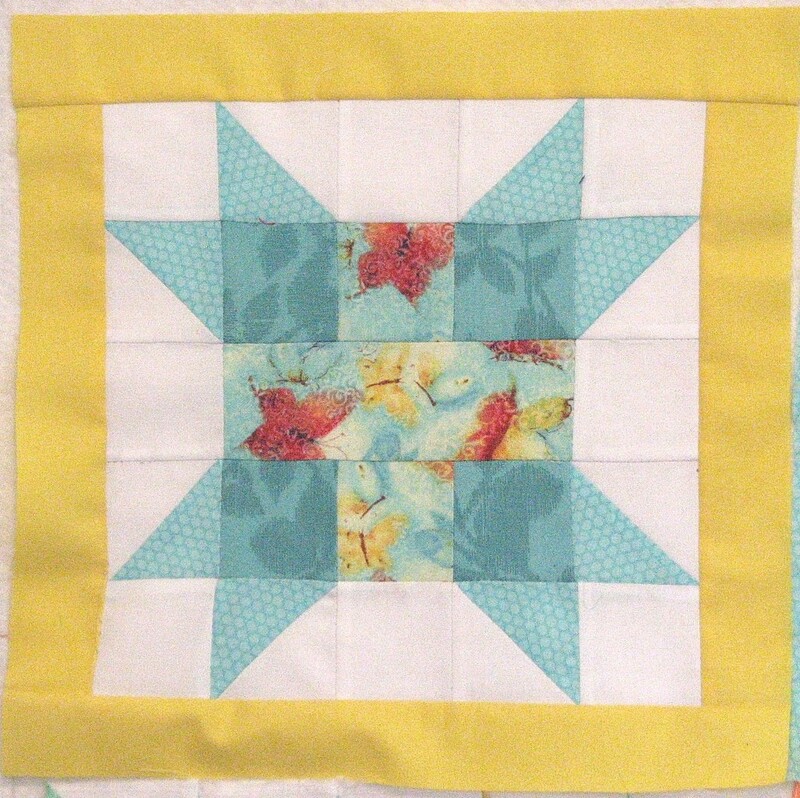 My first quilt was a quillow, a combination of a quilt with a pillow sleeve on the back. The quilt could be folded up and slipped inside to become a pillow. It was given to my mom for Christmas. Over the years, one of our dogs, Daisy Darling, claimed the quilt as her own. 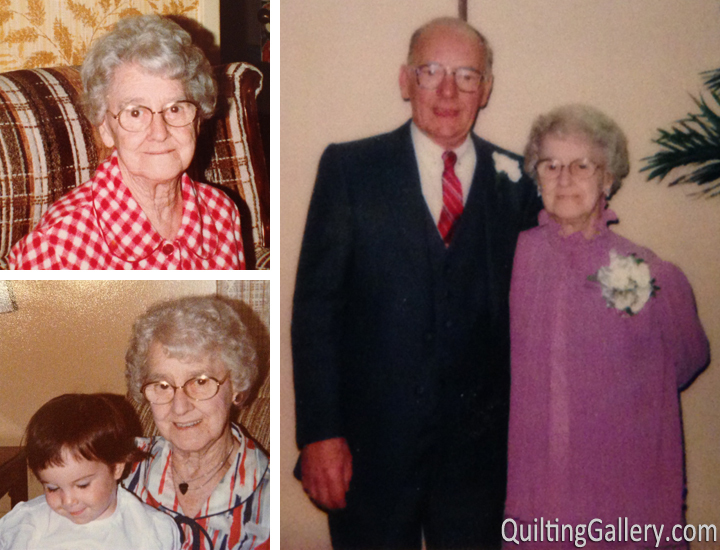 When she passed away, the quilt was buried with her wrapped in it. 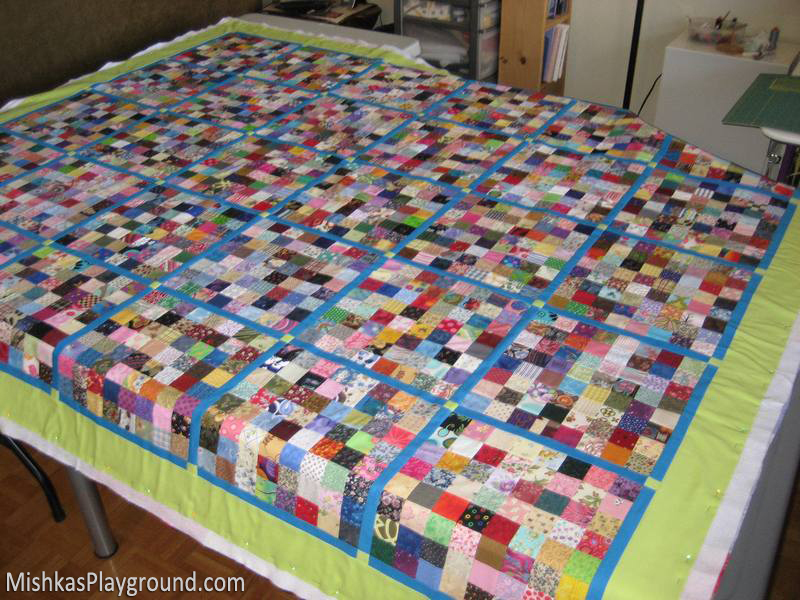 Colour, colour, colour … I love vibrant, colourful quilts. I am most drawn to appliqué and pictorial quilts. The workmanship that goes into these quilts is just amazing. While I do know how to appliqué using various techniques, one day I hope to tackle a Baltimore-style intricate design, all by hand. One day! For now, I admire the work of others. I find pictorial quilts incredibly interesting. I am in awe of the quilt maker’s vision to make such beautiful creations. I don’t really think I have the eye for this type of work, but I would certainly love to take a class, learn and try my hand at it. I also love strong geometric quilts in various gradients of colour, like a colour wheel, where each section merges into another colour. Again, it’s a skill, one I’m not sure that I possess, but I do hope to one day explore further. Miniatures, those super intricate mini designs that are often framed in glass, make me stop and stare in awe at their beauty and only wish I had that kind of patience. We all have parts of the process we ‘prefer’ more than others. What part of quilt making do you ‘Prefer’ most and why? And which the least.. and why? For me, it’s piecing. I love sitting at my machine and getting into a rhythm of feeding the fabric through the machine while listening to the machine hum away as it makes each stitch. When I need to de-stress, or just feel the need to play with fabric, I’ll grab one of my pre-cut scrap boxes and just stitch a whole bunch of four- or nine-patch blocks. No pattern, no idea what they’ll be used for… just enjoying the process of stitching and playing with colour and little bits of fabric. Oftentimes, I’ll start experimenting, and even if the idea doesn’t pan out, the time spent at the machine, being creative, is time well spent in my opinion. My least favourite task is attaching sashing strips or borders. I find it time consuming and rather boring. 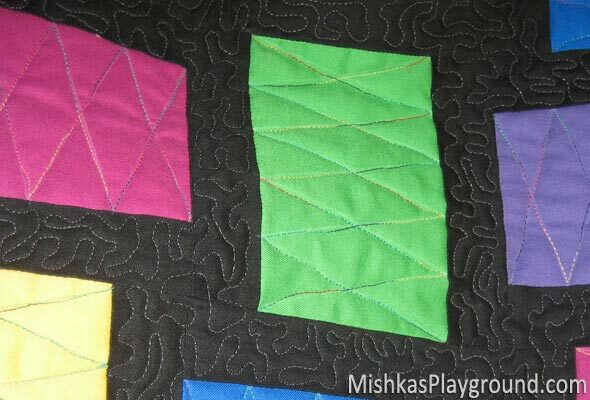 I often cheat and use cornerstones when I have rows of quilt blocks that need to be sashed. It’s easier to nest the seams and to align the blocks straight. Still on the boring side, but that little block of colour adds interest and breaks up long pieces of the same fabric. Below is my postage stamp quilt http://quiltinggallery.com/2012/03/25/my-postage-stamp-quilt/, with lime green, 1″ finished, cornerstones. Yes, I’m a freelance web developer. 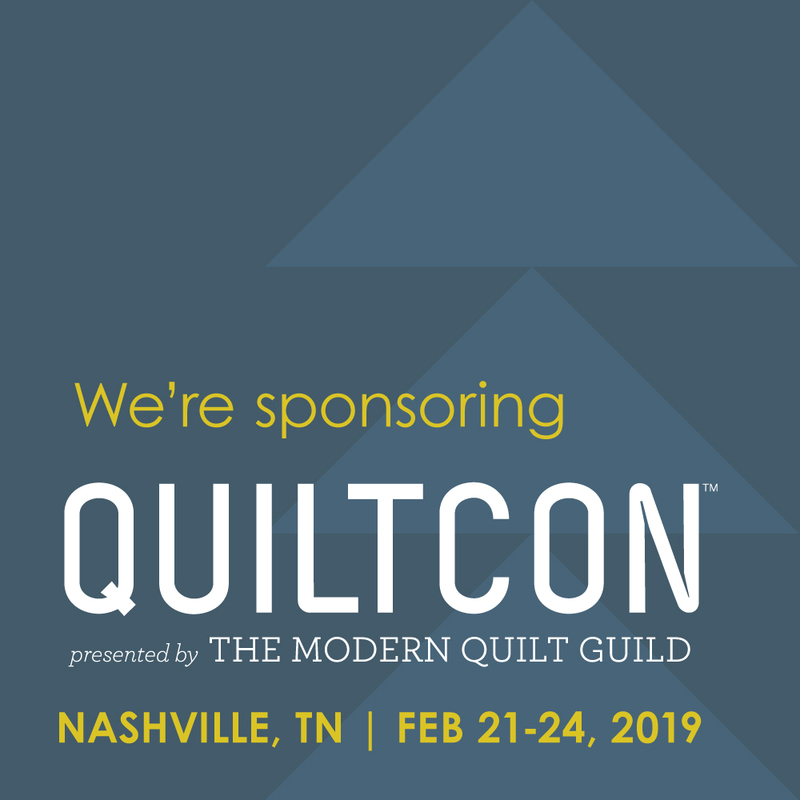 I actually created the Quilting Gallery http://quiltinggallery.com/ site as a way of combining my passion for quilting with my business life. When I left my full time job to become self-employed, 17 years ago, I took a long hiatus from quilting to build up my business, move from Toronto to Ottawa and explore other interests. I needed a creative outlet, something to get me off the computer, and started quilting again. I still have some web clients that I maintain sites for, but the industry has changed, and I haven’t really kept up with all of the changes so I’m not actively looking for new clients these days. I also love to crochet, though I’ve barely picked up a hook in the past several years. I was helping my mom finish an anniversary blanket a couple of weeks ago and realized how much I miss it. I plan to pick up some super cute yarn and make a few items for to donate to children’s charities this winter. My photo is a blanket I made several years ago. Do you have a furry quilt inspector? Yes, I do, Milo. He’s almost three years old and has been with me since he was 10 weeks. 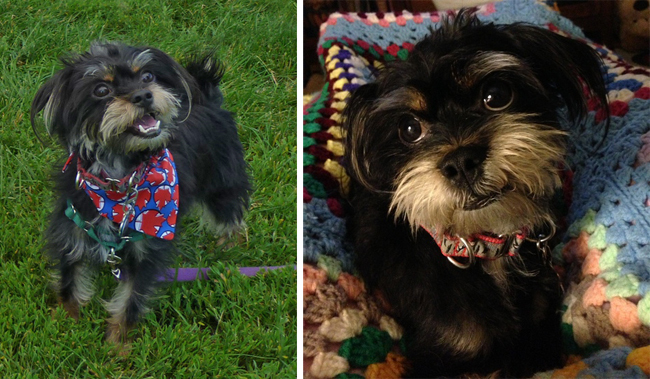 He’s a real mix, but mainly Yorkie and Shiu Tzu. He loves to play fetch, does several tricks and even has a girlfriend. I can’t imagine life without him. 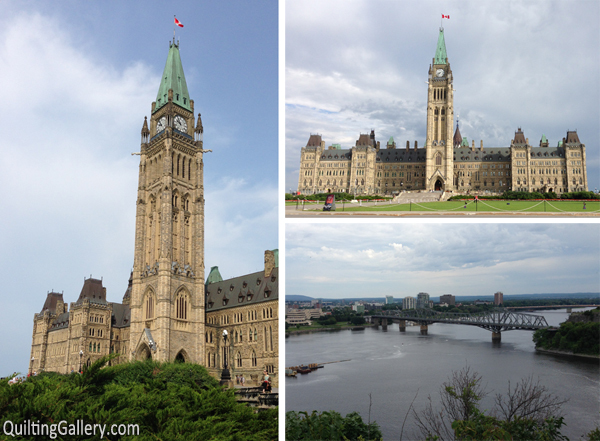 I live right downtown in Canada’s national capital of Ottawa in the province of Ontario. It’s less than one hour for me to drive to the US border town of Ogdensburg, New York. Being the capital, it is a tourist town pretty much all year round. There are many events that happen, to attract the tourists and for the locals to enjoy. My favourite spot is Parliament Hill. It’s where our federal government sits and has their offices. It’s comprised of three historic buildings with two huge lawns at the front (perfect for playing fetch with Milo). There are gorgeous walkways in the back that overlook the Ottawa River and Gatineau, Quebec. I used to take Milo up there several times a week, but since he has a girlfriend now, we go out with her. I love walking the grounds and just staring across the river, occasionally watching the boats. It’s peaceful, very secure and the views are just amazing. Most of the tourists don’t bother to walk around the back of the building, they miss seeing how beautiful it is back there. I have two tips, somewhat related, and no doubt very different from what others might consider a tip from a pattern designer. They both feed into my OCD tendencies and are practices I only wish I had implemented when I first started quilting. The first is to always, always cut your leftover fabric into useful sizes when you’re done a project. 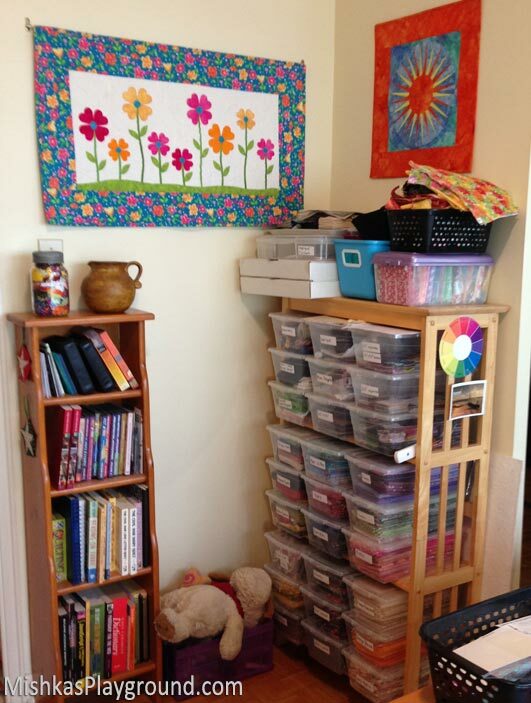 When I first started quilting and for many years after, I’d throw all scraps and leftovers into a HUGE plastic container to deal with later. Well, the years passed and that one container became two … until I just couldn’t stand it anymore. I needed a scrap-saving system in place to deal with the leftover fabrics and give them new life in a different project. It doesn’t really matter what size of scraps you decide to save, but here’s what I keep: 10″ squares (for scrappy backings), 2.5″ x 4.5″ rectangles, 4.5″, 2.5″, 2″ and 1.5″ squares. When I finish a project, all leftover fabric is cut up into my scrap saving system, with one exception. I keep ONE small bin, and if the leftover fabric is large enough and something I really like, it’ll be pressed and kept flat in the bin. I use these larger scraps for testing blocks, techniques and for creating free Block Library http://mishkasplayground.com/block-library/ tutorials. 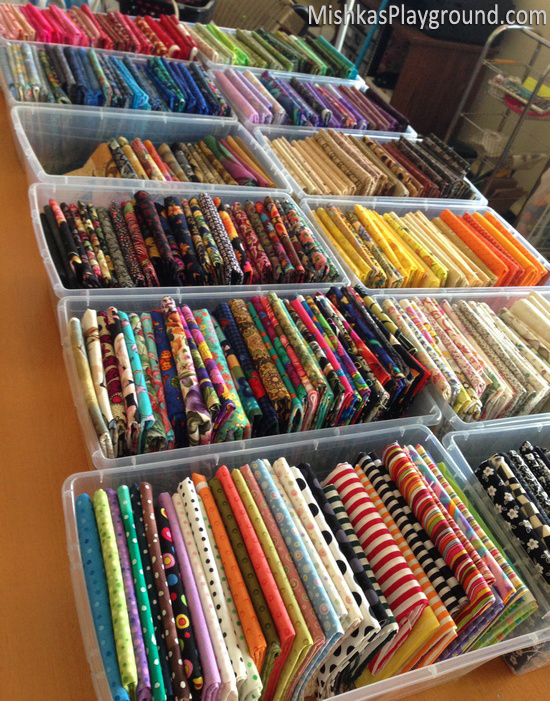 My second tip is to organize your fat quarters by colour. I did a huge organization of my space [http://quiltinggallery.com/2013/04/21/organizing-part-1-of-who-knows/] last year, and I cannot believe how much quicker and easier it is to choose fabrics for a project now that they are all organized by colour. I store my fat quarters in plastic shoe boxes and if I purchase more of a specific colour that just won’t fit into my bin, another less-loved fabric is removed and cut up into my scrap-saving system. No over-flowing bins here as I only have so much room! 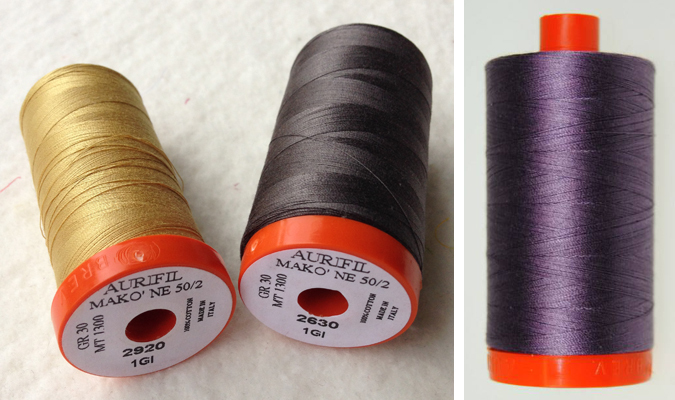 My three favourite Aurifil colours are 2920, 2630 and 6735. I love how 2920 works so well with so many different fabrics and colours. 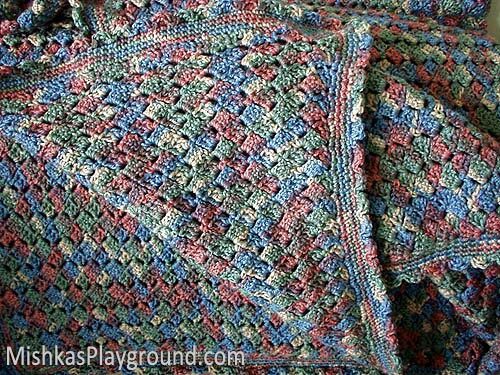 It adds sparkle and pizzazz as a quilting thread. I do a lot of stipple or dense quilting on solid fabrics. To make it easier to see while stitching and to add some interest to the quilting, I love using 2630, dark grey, on black fabric. My third favourite thread, is a new one released this year. So far I’ve only seen photos of it, but I can’t wait to get my hands on it. Thread 6735 is such a gorgeous shade of purple. I’m sure I’ll be using a lot of this one. Here is a close-up of some quilting in progress using the dark grey thread on black background. It might look like it’s too silver, but that’s the flash from the camera. I was extremely pleased with the finished quilt and the little boy I gave it to loves it as well. My studio space takes up half of my living room and what would be my dining room. It’s a long galley like set-up, with a tiny hook on one side. I have lived here for seven years, and over that time the space has changed, and right now, I’m really happy with what I have. If I could change anything, it would be to have the design wall located elsewhere. Currently, it sits behind my desk and doesn’t get the best light in the room, which is good for not worrying about the fabric being exposed to sunlight, but not great for taking photos. 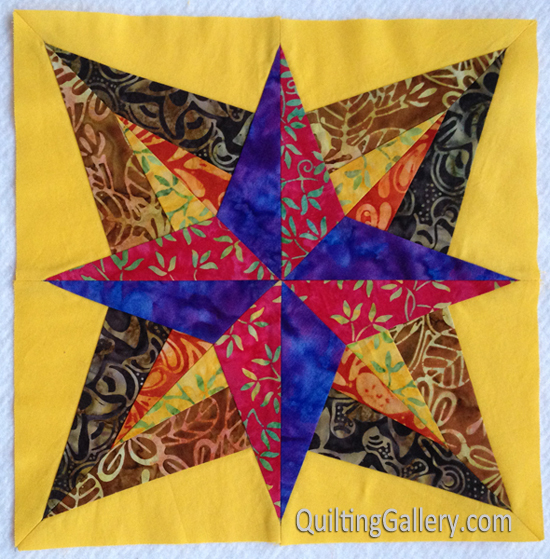 This year, I am teaching my Delightful Stars [Click to http://quiltinggallery.com/learning-center/delightful-stars-quilt-along/] pattern to quilters around the world. 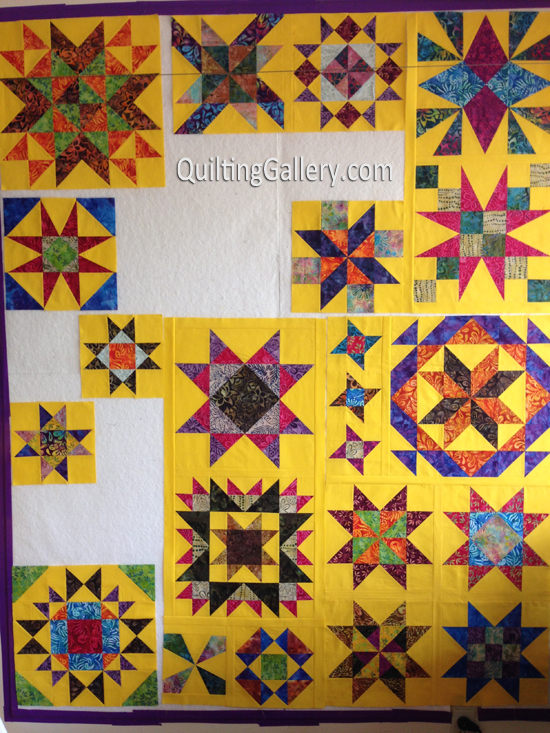 The quilt finishes at a large queen size and contains 25 unique star blocks. While we only have two block lessons to do before joining the top, borders, quilting and binding, everyone is welcome to join and catch up when they have time. My Nana is my inspiration for my Button block. She was my great-grandmother on my mom and grandfather’s side. I was the first great-grandchild and it was another 11 years before the next one, my sister, was born. I’m very fortunate to be the only cousin of my generation that has such wonderful memories of her. She passed away shortly after my 19th birthday. In the photos with my Nana are my grandfather (her son) and my sister. A few years ago, after I started quilting again, I asked my mom if she knew whatever happened to Nana’s buttons. I was shocked to discover my mom had them. Of course, I harassed her for a few years before she finally gave them to me. The yellow tin has long since rusted away, but the buttons have a special box in my studio and, even now, they are still fun to play with. My mom finally confessed and told me that when I went home, Nana used to cut all the strings and put the buttons back in the tin so I’d have something to do on my next visit. She must have missed a few as there are some stringed buttons in my box. The Book you are currently reading – I’m listening to Concealed in Death by J.D. Robb. Just love her books. Last Movie you Watched – I’m not much of a movie watcher, so I have no idea what movie I last saw. However, this summer, I am re-watching all of the “24 series” of shows and will finish off watching the return season that stared a few months ago. Your current favorite Song – I haven’t bought any new music in a while, and even if I did, I doubt I’d know the name and/or the artist of a favourite song! LOL I’ll have to pick a classic favourite, Lorelei by Styx. The snack you crave – Chips and pretzels… salty! The Color you have always LOVED.…. Purple … and now that I have nieces, Pink! I have a surprise this month!! 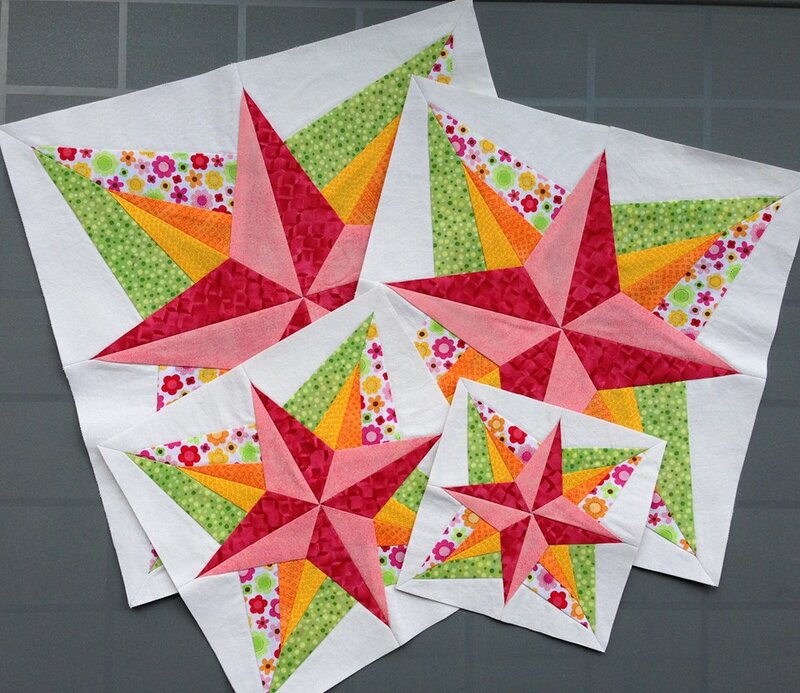 Not only do i have my block, but I’m giving away TWO copies of Michele’s Delightful Stars Patterns! 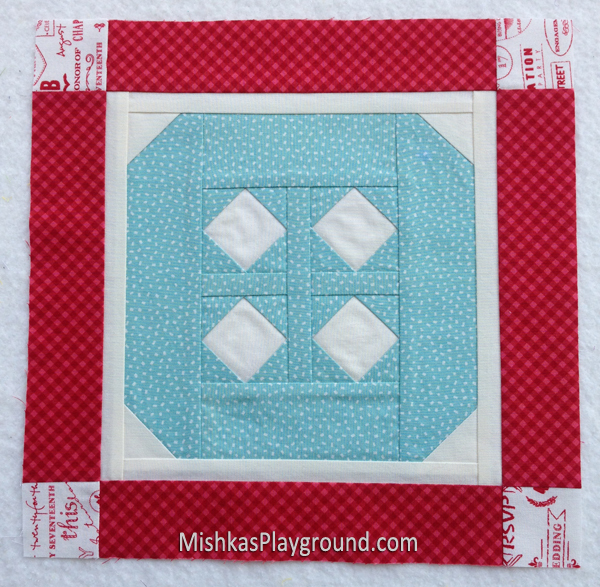 CLICK HERE to see my button block AND to enter to win! 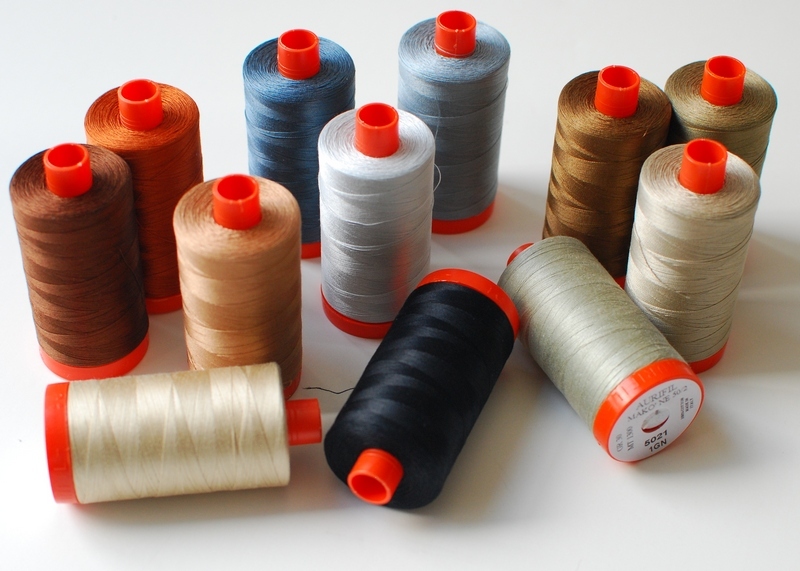 The winner this month is sharonhuismith She wins a Thread kit! Enjoyed the interview and I love Michele’s block! Great interview and love the block! I really loved making this months Button Block! Thank you Michele for being our designer this month! So much fun! And A terrific interview! Thank you for sharing.